This amazing GoPro Video made by Jabberwocky guest Olivia Wreford depicts all the fun and highlights of a family holiday in Antigua and it really captures the sights, sounds, feeling and rythm of this wonderful island paradise. Discovered the wonders of the underwater world diving with Indigo Divers, Shopped in St Johns, partyed at the famous Antiguan Sunday night 'Jump Up' at Shirley Heights and of course tasted the odd drop of the local rum! .... obviously a great time was had by all! Watch and Enjoy and remember this could be you! AWARD WINNERS EIGHT YEARS IN A ROW! 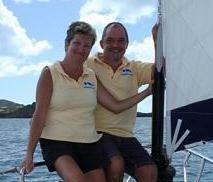 Click here to read about the owners of Jabberwocky Yacht Charters.